Dr. Christine Blasey Ford – There was no question that the Kavanaugh hearing moved me. I was devastated, uplifted, and triggered all at once along with many of my girlfriends and other sexual assault survivors. Her bravery will forever be remembered for me in this piece. A portion of the proceeds for this print are donated to RAINN, the National sexual assault telephone hotline. Justice Ruth Bader Ginsburg – the Notorious one original sold long ago, but the print can still be acquired HERE. Anita Hill – I was asked to represent Anita after posting my “Ford Tough” piece and I couldn’t say no. I am donating half of the sale of each print to RAINN, the National sexual assault hotline. Maxine Waters “you better shoot straight!” If you don’t have a deep fondness for this woman I just don’t understand. Like Ford and RBG – the framed original Maxine piece has found a home, but the matted print is available. Emma González – I write this tonight with the knowledge that a Parkland survivor has taken her life. Not everyone can be a figurehead of the movement and many suffer in silence. My heart goes out to every one of those kids and all the victims of the countless shootings in our country. I know those scars will be carried for a lifetime. I really hope Ms. González continues to fight the good fight and we see big things from her in the future. The print is still available and HALF of each sale will go to March For Our Lives. Sharice Davids – It isn’t fair that I haven’t painted Deb Haaland yet, but Sharice is so striking I couldn’t resist. She is one of the first Indigenous Women elected to Congress in the recent blue wave. The framed original is still available. Nancy Pelosi – I have to admit, I admire her, but I’m certainly not her biggest fan, but the state of the Union clap had to be immortalized as those who know me know – I LOVE shade. Again, the original sold, but the print is available. Alexandria Ocasio Cortez – Now, AOC I adore! The original and the print are both available. 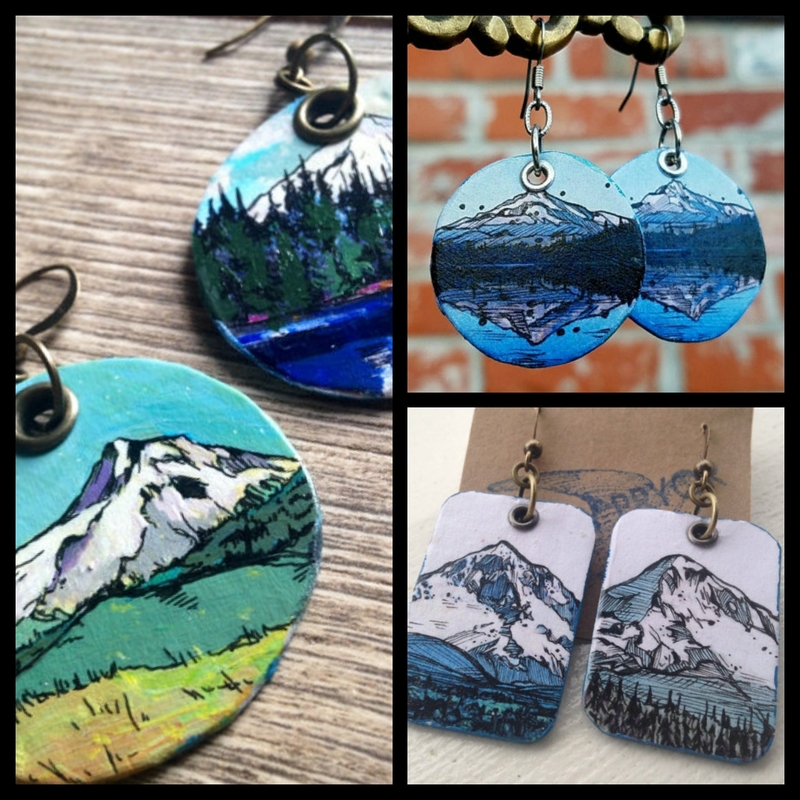 There have been a few additions to my Oregon inspired hand-painted jewelry collection and I thought it time to show them and the spaces that inspire them a little love. 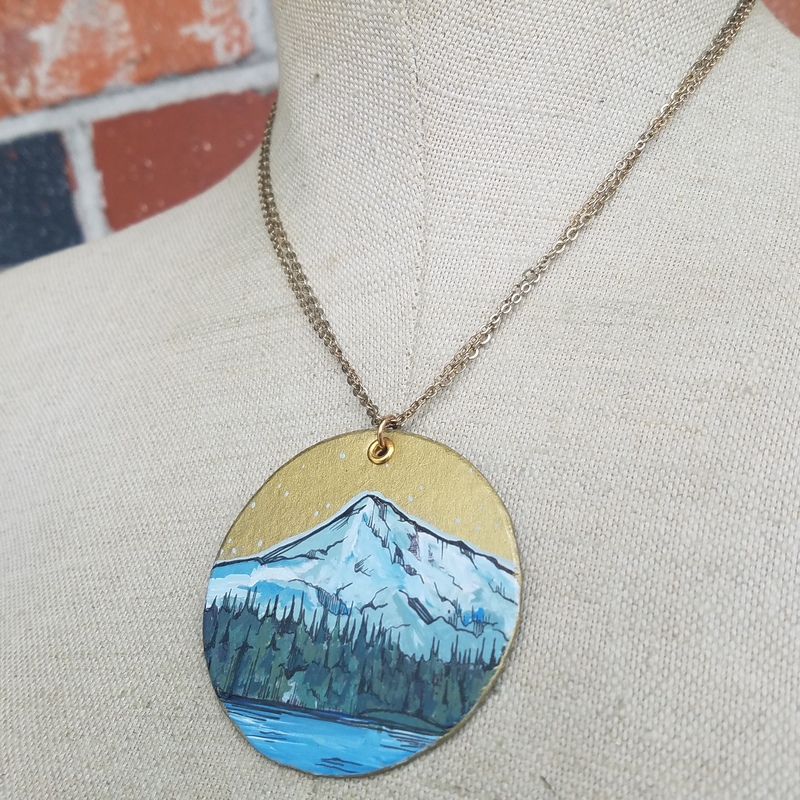 Above is my first painted Oregon charm necklace. It is sealed with non toxic acrylic and has a real gold leaf background. It is finished off with a gold grommet and has doubled up fine, vintage gold plated chain. The charm showcases that sweet baby that I spoke of a few days ago, Mt Hood. You can purchase one HERE. 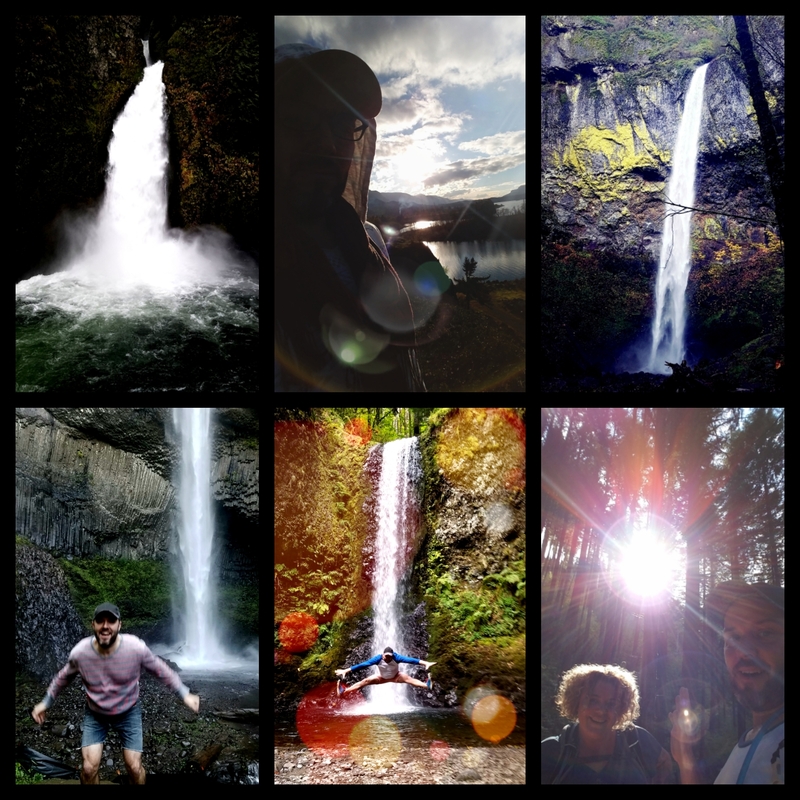 Punchbowl Falls is a beauty to behold. In recent years the trail has become so crowded that I tend to shy from it. Recently some teenagers started a huge fire with fireworks on this very trail. The blaze closed down many of these beloved spots, so us Oregonians are really hurting. 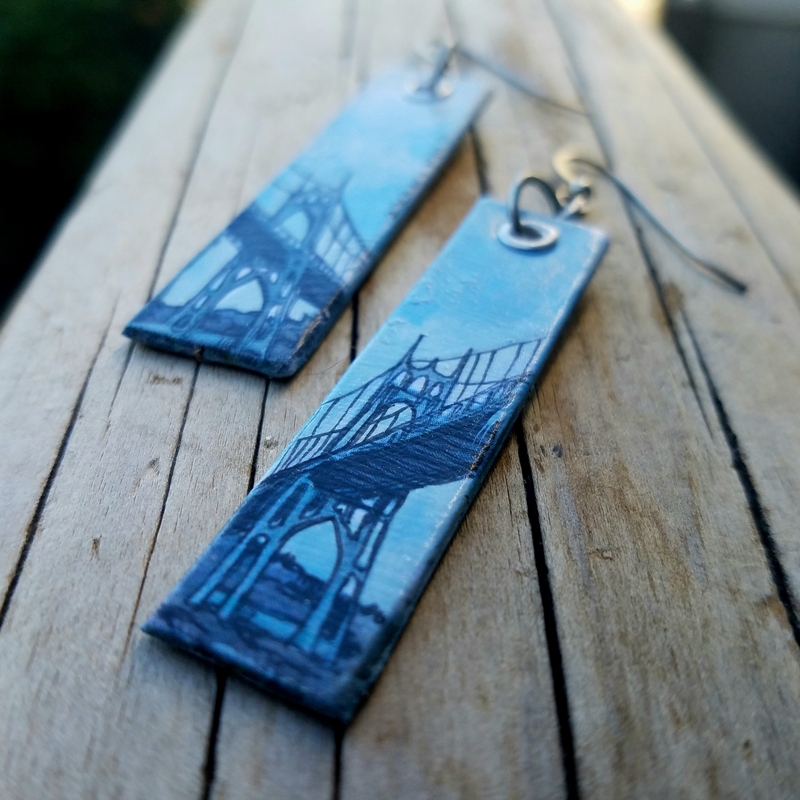 Hoping these earrings remind us of those better days that are bound to return. 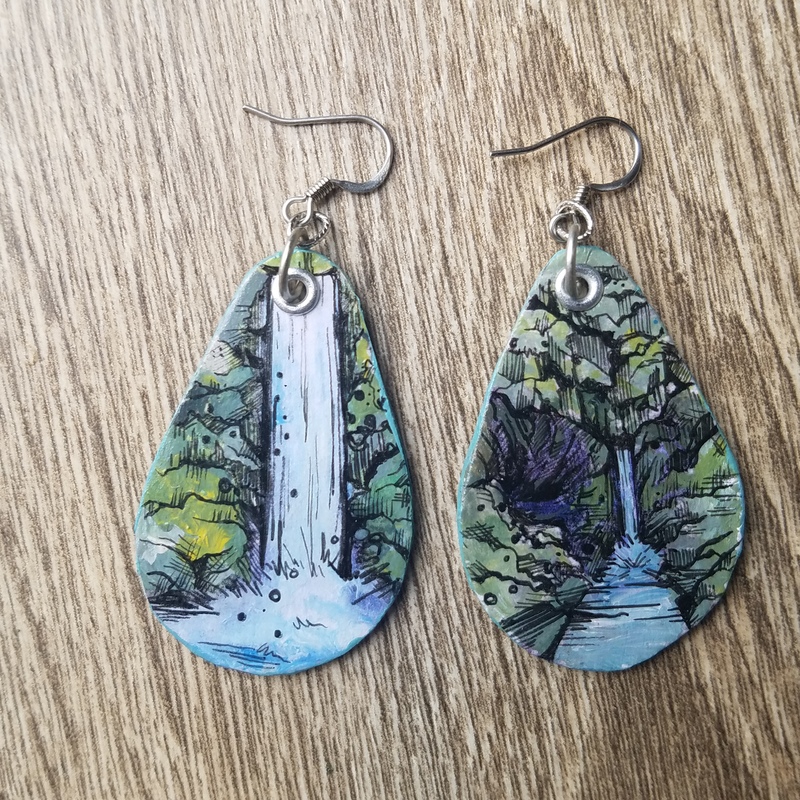 Get the earrings HERE. This beautiful bridge sits just to the north of downtown Portland, connecting the neighborhood of St Johns to Hwy 30 and Forest Park. This is the first time I have painted these so slender and long and the shape compliments the cathedral-like bridge perfectly. Get a pair HERE. Mt Adams sits to the Northeast of us and is truly magnificent. I have only visited the Mt Adams wilderness once and my breath was taken for certain. The terrain was quite distinctive compared to what I am used to closer to Portland. You need permits to hike on many of the trails on Mt Adams because the majority of it is still First Nation owned, which is amazing. 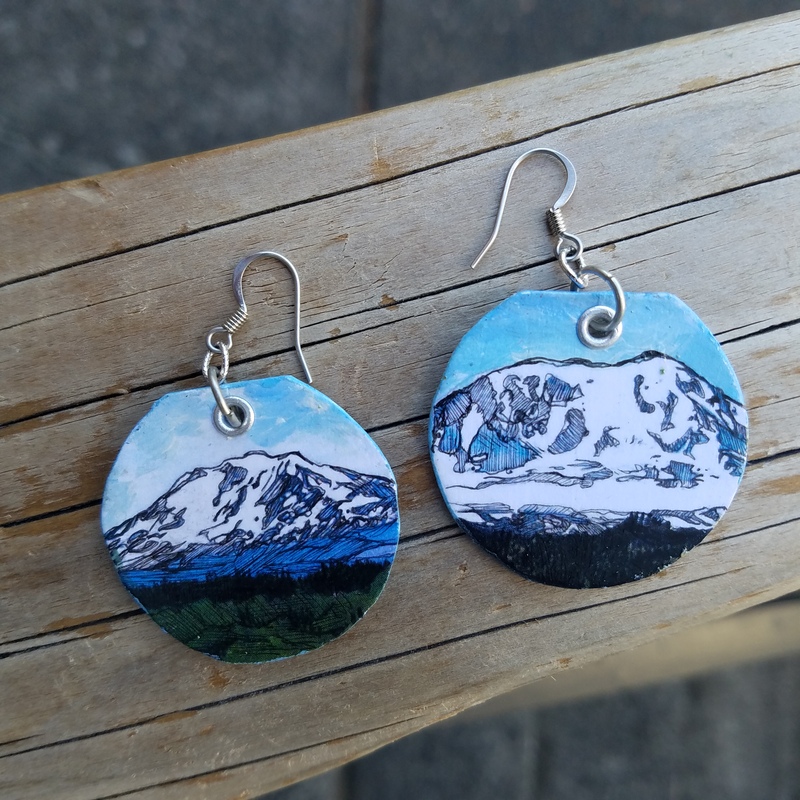 You can get these earrings any time, HERE. 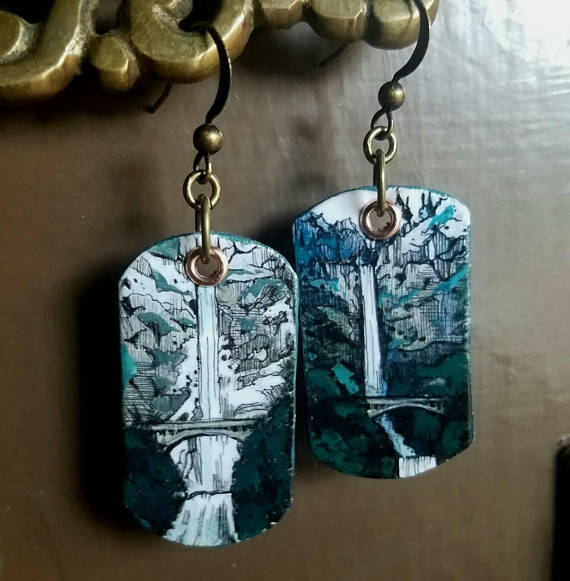 No collection would be complete without Oregon’s crown jewel, Multnomah Falls. I have visited countless times, even with the terrifying masses crowding the viewpoints. I’m willing to brave those crowds just to stand for a moment in the spectacle of these falls. Above I have two styles of the falls, Winter (top) available HERE and Summer (bottom) available HERE. Finally I re-visit Mt Hood! On clear days the mountain gleams in the distance from many vantage points in Portland. 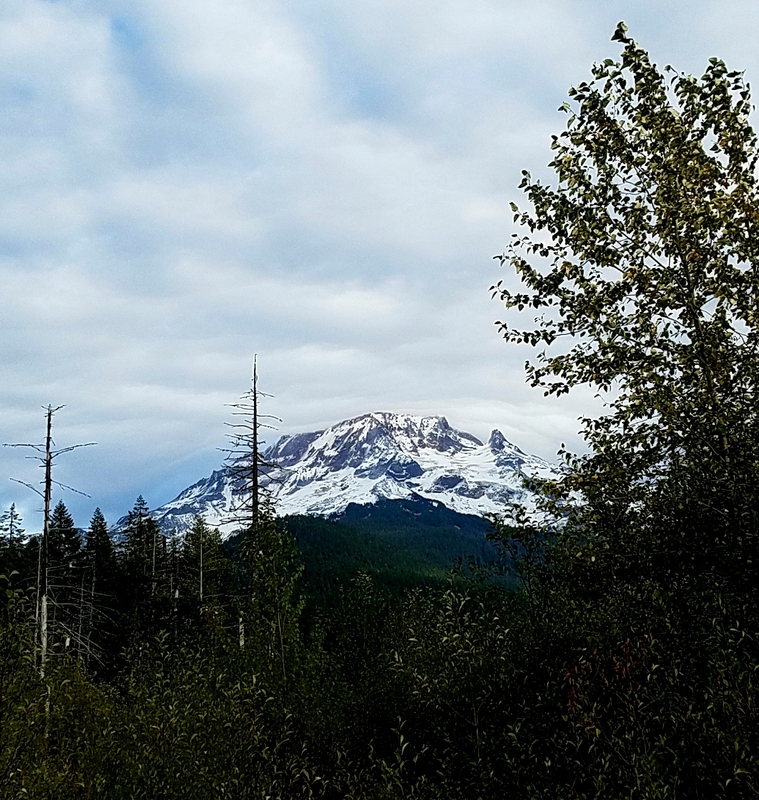 Every single time I visit closer to the mountain and it comes into view I exclaim something, be it a curse word, or a simple “Wow” – the mountain never, ever fails to impress. I have three pairs listed on my etsy page, version 1, version 2, and version 3. 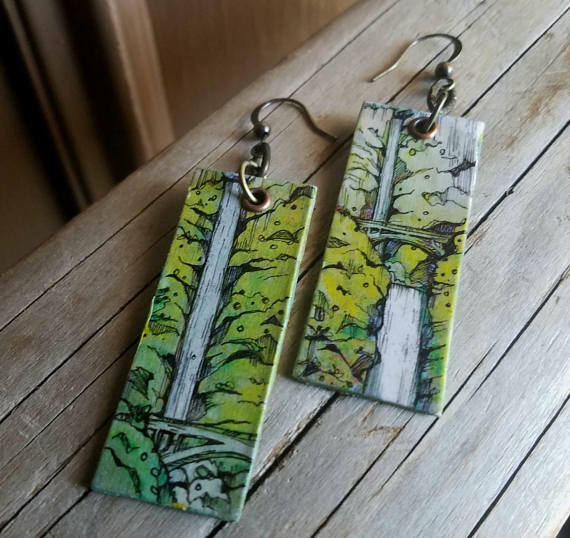 You can also see many more nature inspired earrings and paintings in my store.